Home security is one of the most important things for many people. Many people are looking to relax without having to worry about their home being broken into. Many burglaries usually happen when you are not home, making it important to take some actions to reduce the risk of your home getting broken into. Whether it is you or your children talking about the upcoming vacation online on social media platforms, mentioning you travel in public forums is dangerous. Anyone can see this and can be seen an invitation to thieves to break into your home when you will be gone. Talk with your kids and ask them to minimize sharing such information online. Thieves and burglars are usually people you don’t suspect, and may even be your friends on social media platforms. These make burglary more difficult, and many burglars usually avoid difficulty. If a burglar spends more time on your home, then there is an increased chance of getting caught. Deadbolt locks will make it hard to break into your home, but ensure you buy high-quality locks that cannot be easily compromised. The locks for the exterior doors should be grade one or grade two locks. These locks that cannot be easily picked and cannot easily give into tampering. Dog ownership has been shown to be a good way of keeping your home safe. Burglars prefer homes that don’t have a dog over those that do. Large dogs can be intimidating because of their appearance and barks. While this is a great way to ward off burglars, it should not be the main reason to own a dog. If your family is ready to take the responsibility of the dog, then you can go ahead and get one. This is the most effective method of preventing future burglaries. Installing a monitored home security system will ensure you get an alert when someone tries breaking into your home. They also have loud alarms that will scare away the burglars before they can do any damage. These systems can also notify the police so that they can investigate why the alarm was activated. Light is counterintuitive by the nature of burglary. Burglars don’t like homes with light because it increases their chance of getting caught. Make sure your outdoor lighting is good. The front and back of your home must be properly lit. 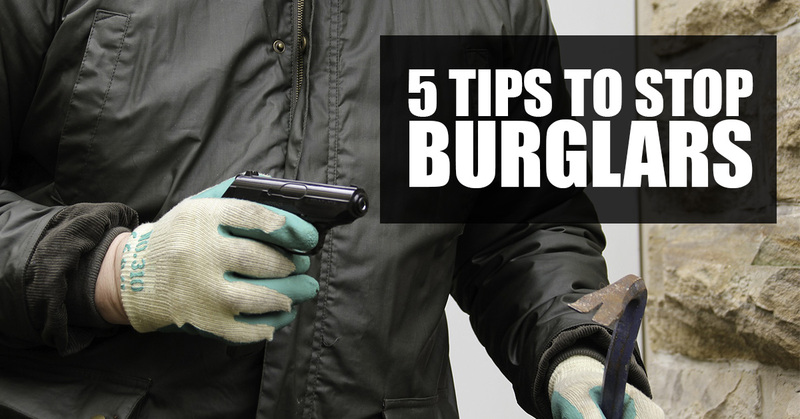 5-Tips-to-Stop-Burglars Home security is one of the most important things for many people. Many people are looking to relax without having to worry about their home being broken into. Many burglaries usually happen when you are not home, making it important to take some actions to reduce the risk of your home getting broken into. Tip 1 - Avoid Mentioning Your Travel Online Whether it is you or your children talking about the upcoming vacation online on social media platforms, mentioning you travel in public forums is dangerous. Anyone can see this and can be seen an invitation to thieves to break into your home when you will be gone. Talk with your kids and ask them to minimize sharing such information online. Thieves and burglars are usually people you don’t suspect, and may even be your friends on social media platforms. Tip 2 - Deadbolt Locks These make burglary more difficult, and many burglars usually avoid difficulty. If a burglar spends more time on your home, then there is an increased chance of getting caught. Deadbolt locks will make it hard to break into your home, but ensure you buy high-quality locks that cannot be easily compromised. The locks for the exterior doors should be grade one or grade two locks. These locks that cannot be easily picked and cannot easily give into tampering. Tip 3 - Dog Ownership Dog ownership has been shown to be a good way of keeping your home safe. Burglars prefer homes that don’t have a dog over those that do. Large dogs can be intimidating because of their appearance and barks. While this is a great way to ward off burglars, it should not be the main reason to own a dog. If your family is ready to take the responsibility of the dog, then you can go ahead and get one. 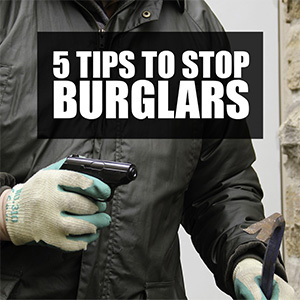 Tip 4 - Home Security System This is the most effective method of preventing future burglaries. Installing a monitored home security system will ensure you get an alert when someone tries breaking into your home. They also have loud alarms that will scare away the burglars before they can do any damage. These systems can also notify the police so that they can investigate why the alarm was activated. Tip 5 - Maintain A Well-Lit Property Light is counterintuitive by the nature of burglary. Burglars don’t like homes with light because it increases their chance of getting caught. Make sure your outdoor lighting is good. The front and back of your home must be properly lit.